For a complete quantum description of molecular systems, it is necessary to solve Schrödinger equations for both electrons and nuclei. 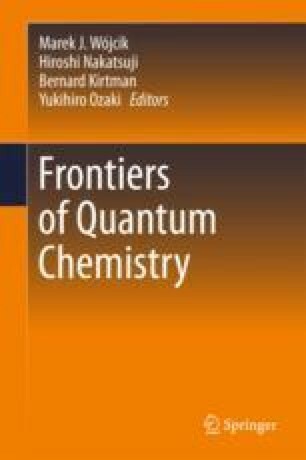 In this chapter, focus is given to approximate methods for solving the nuclear Schrödinger equation. Similarities and dissimilarities compared to the practice employed for the electronic case will be noted. A many-body view on potential energy surfaces will be used to motivate a many-body view on the general problem of solving the nuclear Schrödinger equation. A second quantization multimode formalism will be outlined and used to formulate many-body wave functions for nuclear motion. The vibrational self-consistent field (VSCF) method is introduced. Full vibrational configuration interaction (FVCI) is introduced as the reference, before primary attention is given to vibrational coupled cluster (VCC) theory. VCC theory is furthermore analysed from a tensor decomposition perspective and with a perspective to scaling with system size. This work has been supported by the Lundbeck Foundation and the Danish Natural Science Research Council. We acknowledge discussions with Ian Godtliebsen and Mads Bøttger Hansen. Support from the COST network Molecules in Motion is acknowledged.